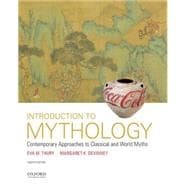 by Thury, Eva M.; Devinney, Margaret K.
Integrating original texts with explanations, interpretations, and theory, Introduction to Mythology: Contemporary Approaches to Classical and World Myths, Fourth Edition, introduces students to a wide range of myths drawn from sources all around the world and approached from various critical perspectives. Eva M. Thury is Associate Professor of English at Drexel University. Margaret K. Devinney is Associate Professor Emerita of German at Temple University.